Pasting formatted text from the web can often be a hassle—but not if you use these tricks. Formatting is easily one of the biggest annoyances when copying text from the web into a local document. That’s not a problem if you’re using a plain text editor like Sublime Text, but it becomes a big hassle in programs like Microsoft Word. Here are several ways you can make sure you get plain text and not words in bold, italics, or a different font every time you paste text. If you’re running a newer version of Word, Microsoft offers a built-in solution to strip text of its original formatting. When you right-click to add text to your document you’ll see three options: paste with the formatting from the source, paste with the formatting of your document, and paste in plain text only. The last option is the easiest to use, but if you want to keep hyperlinks, bold, or italics choose the merge formatting option so it blends in with your document’s text. To set your paste options so it automatically pastes plain text only click on File > Options > Advanced, and then under the Cut, copy, and paste subheading choose the paste options you want. Another option is to have your text automatically stripped from the site through the magic of web browser extensions. 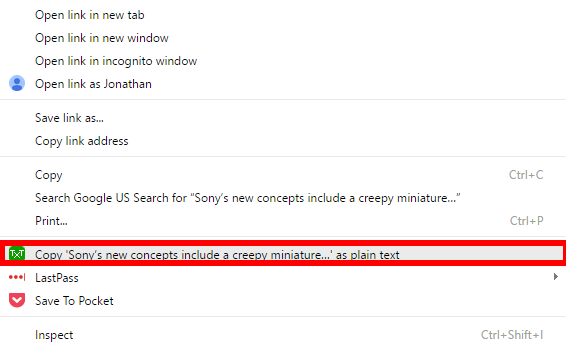 Firefox users can try Copy Plain Text 2. Once it’s downloaded and installed type about:addons in the URL bar. Find the entry for the add-on and click Options. Under Behavior, check the box that says “Make as default Copy action.” That way everything you copy will be automatically stripped of text. 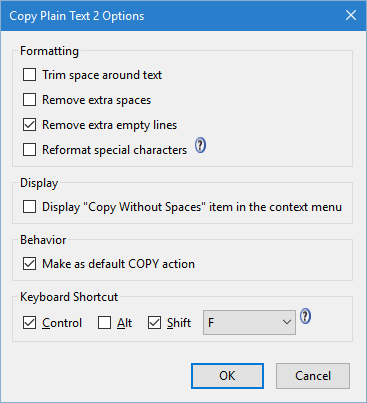 to the context menu for copying in plain text as pictured here.